The first interactive storage system! appmybox - an ingeniously simple archiving app for your smartphone and tablet that makes organising fun. Finding things again is child's play! From now on, you will never have to look for anything again. With appmybox you can organise and archive boxes and objects clearly in your smartphone or tablet - using the unique QR code provided on all storage boxes from Rotho. Scan the QR code on your Rotho box. The corresponding item is now automatically created in appmybox. Take a picture of everything that’s supposed to go in the box and collect additional information if you need it. The app will save your entries in the selected box. Find your archived items at any time - quickly and easily on your smart phone. Have a look at the functions of appmybox in the following video. 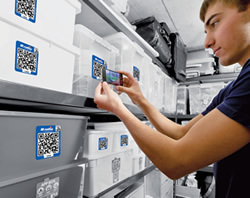 appmybox works exclusively with the QR codes found on all storage boxes from Rotho.